COLUMBIA, Mo 4/2/14 (Beat Byte) -- Columbia Public Schools wants to take on a shocking amount of new debt: a quarter billion dollars in 8 years, if voters approve bonds at the polls. Though district officials are saying "no new taxes" until 2022, if history is any guide the debt will require significant property tax hikes to repay. The cost of school district business has skyrocketed in recent years, as new school and infrastructure construction has become increasingly tied to local developers. The $80 million Battle High project included over $4 million in new infrastructure that will partly service the Bob Pugh-Tom Atkins-owned Somerset Village subdivision. CPS bought the land for the high school and a new elementary school from a development firm Pugh and Atkins own, paying more than $50,000/acre. The district paid even more for land near the Thornbrook subdivision, paying the mega-developer Sapp family roughly $80,000 per acre. Superintendent Chris Belcher, Ph.D. released the new debt figures at a candidate and ballot issue forum last month. This month, CPS is asking voters to approve the first round: a $50 million bond plus a sizable property tax increase to pay it back. The other $200 million will be presented to voters in $50 million increments every two years until 2022. 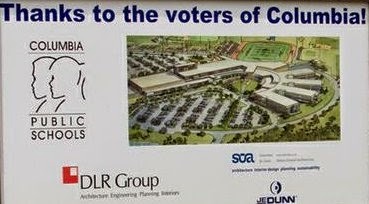 A handout Belcher distributed shows plans for a new elementary school near Battle High in 2016, followed by generic plans each year thereafter: new or renovated schools; technology; and various facility repairs. A 20-year history of bond debt at CPS showed an average $20.2 million every two years from 1992-2007. During that 15-year period, CPS built four new schools and expanded Rock Bridge High School, all for $41 million. 1992 -- $15 million bond debt, including $7.2 million to build Gentry Middle School. 1994 -- $12.6 million, including $7.5 million to build Smithton Middle School. 1996 -- $12.75 million, including $8.3 million to build Lange Middle School. 1998 -- $19.9 million including $7.8 million to expand and renovate Rock Bridge HS. 2000 -- $35 million, including $10.7 million to build Paxton-Keeley Elementary School. 2010 -- $120 million, including roughly $80 million to build Battle High.